The Crescent black steel log holder blends elegance with functionality. The simplistic curved design of this log holder provides a visual touch to complement your fireplace setting without distracting from the overall appearance. The top sports a crescent shape, which naturally condenses the logs together, keeping an organised stack. This will aid in maintaining an area free of debris. 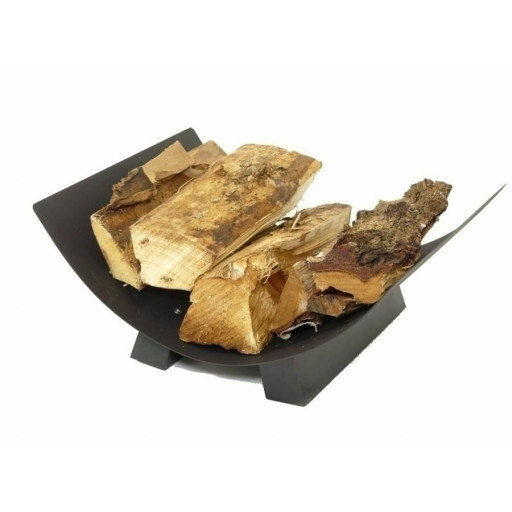 The log holder rests upon two rectangular bases keeping it firmly rested on any terrain. Loading and unloading wood is a breeze and without hassle with its open top design. Impress your guests with its clean and sleek design that accents the décor of any setting or home. Are you entertaining guests on your back patio? Having a romantic dinner with that someone special? The contemporary design is a perfect addition to any outdoor party or an intimate indoor evening. The size log holder adds to its versatility. You can easily move it between the outdoors, indoors, or even transport to another location. This Crescent black steel log holder is constructed with finest materials. It provides strength and durability while leaving a smooth clean finish. The high-quality construction accommodates an ample amount of storage four logs up to 17”. It will radiate the desired warmth and ambiance four the duration on your night.